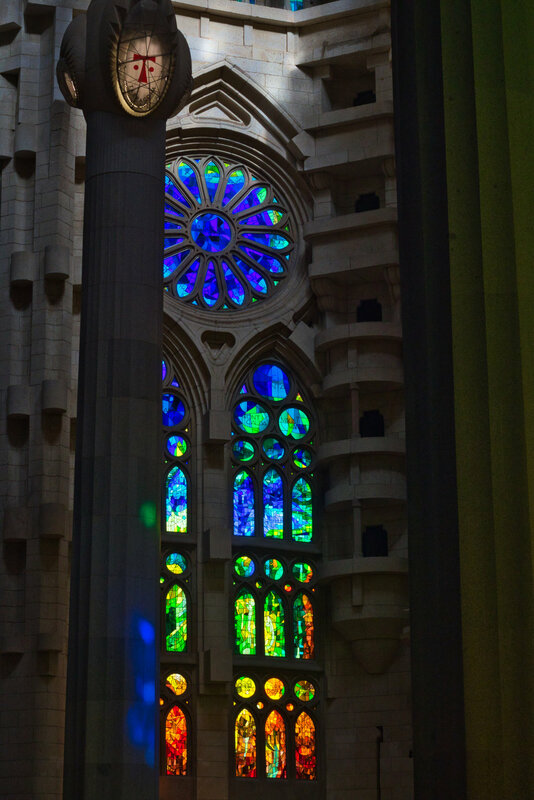 In front of some of the stained-glass windows of La Sagrada Família stands a support pillar. Barcelona knows how to appeal to the senses. As an artist, food lover and wanderlust traveler, its fresh food, upbeat music, nearby beaches, international community and playful architecture easily captured my heart. However, as an agnostic atheist, I was surprised to find that nothing made me fall in love with Barcelona like the breathtaking Roman Catholic church La Sagrada Família, which translates to ‘The Sacred Family’ and refers to Jesus’s followers. A model of the completed Sagrada Família stands in front of the in-progress church. This photo was taken in July at my first visit inside the building. As I headed towards my second visit inside the church in mid-September, the Catalan flag for independence hung from an apartment outside. Despite being incomplete, the edifice was overwhelming and awe-inducing. Sagrada Família’s anticipated completion is 2026, 100 years after its architect, Antoni Gaudí, passed away and 144 years after its groundbreaking construction began. Over the five weeks I spent in Barcelona this summer, I made pilgrimage to the UNESCO World Heritage site four times, paying to tour the inside twice, and I eagerly look forward to visiting it again once finished. Upon entering the imaginative structure for the first time, I was moved to tears. Since then, I’ve contemplated why I, an agnostic atheist, had such a visceral reaction to this place of worship. I’ve concluded that the reason is because Sagrada Família is a transcendent place. Fittingly, the official website notes the building is, “an international center for spirituality which, in an exceptional setting, invites people of all backgrounds and faiths to share in a sense of life based on love, harmony, good, generosity and peace.” Its mind-bending form, meticulous detail, and exuberant use of light and color seamlessly communicates and connects people across cultures, belief systems and upbringings. The 45-minute audio guide only scratched the surface of the vast detail and symbolism entombed in within Sagrada Família’s walls. On whether Gaudí was concerned by the time it was taking to build, he remarked, “My client is not in a hurry,” referring to God. 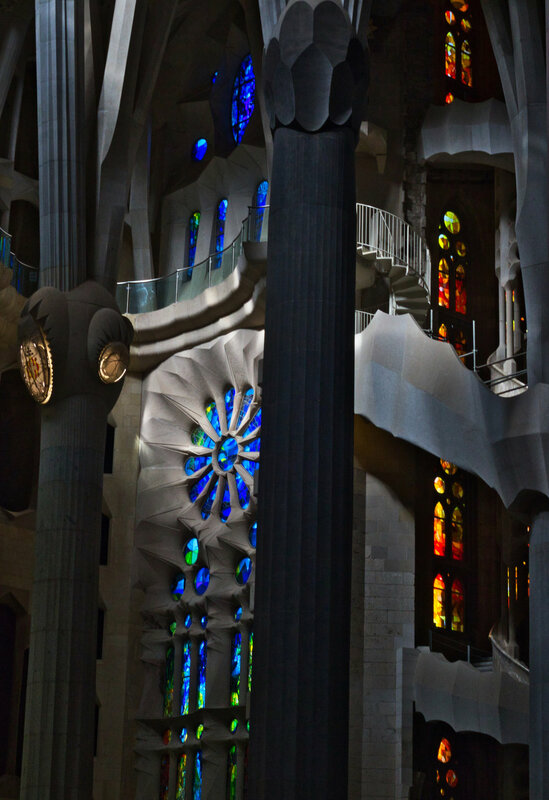 Gaudí designed the church as tribute to God and drew inspiration for its form from the beauty of nature. When complete, the impressive structure will be the tallest religious building in Europe and soar 170 meters (560 feet), one meter short of Barcelona’s highest point, Montjuïc hill, as Gaudí believed his creation should not surpass God's. The pillars supporting the ceiling were crafted from a variety of stone and branch out in the likeness of trees. As one cranes their neck back to see up to the rafters, twinkling lights emerge outlined with stars, resembling daylight in a forest. Reading quotes of Gaudí’s on Sagrada Família gives me chills. One of my favorites describes his relationship with his muse: “Nothing is invented, for it's written in nature first. Originality consists of returning to the origin. Thus, originality means returning, through one's resources, to the simplicity of the early solutions.” The church’s details, given life and born out of nature, speak directly to our humanity and resonate with the universal and unanimous among us. The designs are otherworldly exactly because of how grounded in our world they are. Visitors’ silhouettes contrast the colors cast upon the ground. 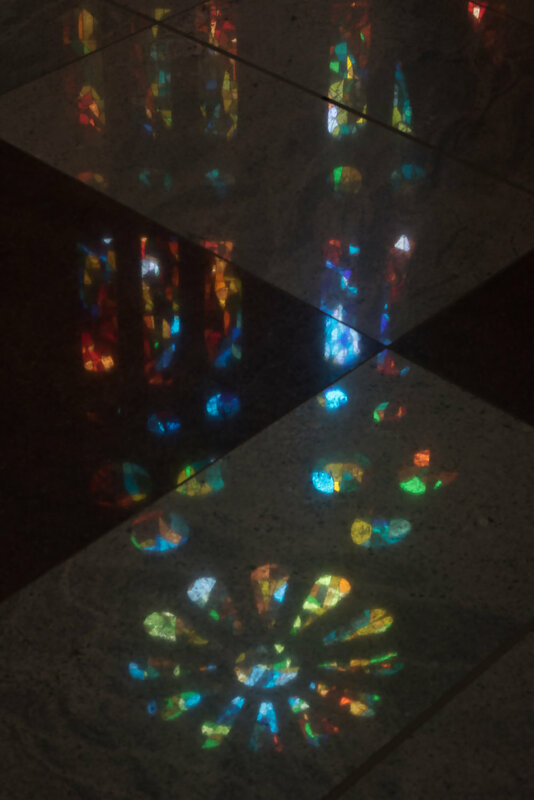 Light shines through the stained glass onto the floor, as shown in the following image. In the words of Gaudí, “Glory is light, light gives joy and joy is the happiness of the spirit.” It truly brought me joy to take this photo of the stained-glass reflection. Enjoying the remarkable building does not require having a head in the clouds though. In fact, looking up was as satisfying as down, as rainbow light from the stained-glass windows danced across the floors. To manifest such an aspirational artistic vision required collaboration from the hands and minds of many. In 2010, an organ with 1,492 pipes was installed. When completed, the organ will have some 8,000 pipes that reflect and reverberate the rainbow light. 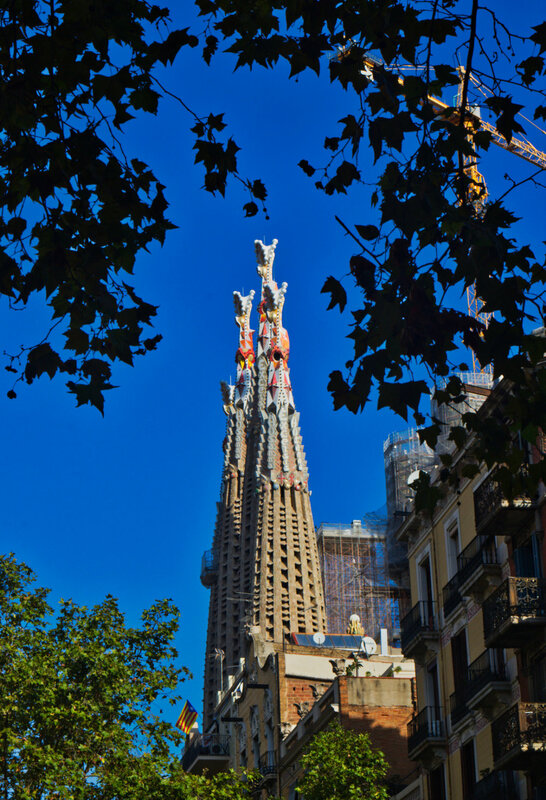 The collaborative efforts of contributors from around the globe point to Sagrada Família’s other sacred family. It will be the work of many people over two centuries that manifest and realize Gaudí’s vision. His ability to inspire those around him has allowed the building to transcend time, and so the construction of Sagrada continues on, building closer to realization day by day. Companies with long-term visions set on transforming the world could learn from Gaudí, who understood that the glory of creation is not for the individual or creator, but for the glory of creation itself. Universal goals will be accomplished by teams of people working together with steadfast commitment. To realize the sacred and transport it from the cosmos to earth, overcoming differences in culture, religion and background, vision must be rooted in timeless, transcendent values. Anyone who knows me knows that I love rainbows. I could look for and write about rainbows happily for the rest of my life (and was overjoyed to recently write ‘Windows into the Soul’ about the rainbow town of Burano, Italy).